SA new tab has been integrated in the ‘Table of Contents’ of the Views which contains the previous ‘Catalog’ plugin functionality, considerably improved. It allows you to add layers from the catalog browser to the View, open files as a Table, save to Favourites, change a layer name in Favourites, etc. The behaviour of the TOC has been improved in terms of layer order and selection of layers. A functionality has been added to hide the legends of the layers that are not visible in the ‘Table of Contents’ automatically. Besides having more space in the TOC, the gvSIG speed is optimized, since in case of web services (such as WMS) it avoids making requests to the server if the layer is not visible. The heat map legend, also known as Hot Spot, has been added. This type of legends are used to identify the gathering of a certain element. More information. New type of legend available and especially useful when we want to visualize a certain phenomenon whose quantity can’t be determined only visually. To do this, this legend also represents the element by means of a symbol, the number of times that the phenomenon exists in a certain area and that the user can adjust. More information. Tools to support temporary data in gvSIG Desktop, known as 4D, have been developed. With this new tools we can assign the temporary parameter to a layer (even if it does not have a date field) and consult the data in a specific moment or time range. It also has tools to generate animations in the View, allowing to see a temporary evolution of the information. More information. This tool allows us to show information about vector entities on a label when we move the mouse over it. We can define what information we want to display. More information. In the European Union, the exchange format defined for Cadastre is GML with a specific scheme. The gvSIG Desktop functionality has been updated to support the latest changes made at GML format. In the case of Spain, it has been verified that the data generated with gvSIG Desktop complies with the cadastral validation. In this version we have included H2GIS database support, the H2 spatial engine. One of the main advantages is the access to the H2 administration tools from gvSIG Desktop, with which using the SQL language we can perform any of the many operations that H2GIS allows and, therefore, adding all the GIS functionalities of H2GIS (they are a lot!) to gvSIG Desktop. Among others: management of 2D and 3D geometries, support of spatial indexes (improving the speed when loading layers), importers of different formats, geoprocessing, triangulation, surveying, network analysis, OSM data download… More information. The Oracle database driver has been updated and optimized, allowing to work with this extended database. In gvSIG Desktop 2.4 there is support for SQL Server database. SQL Server is a database management system of the relational model, developed by Microsoft. SQL Server is one of the most used databases. More information. In gvSIG Desktop 2.4 the support for SpatiaLite database has been added. SpatiaLite is a SQLite database engine where spatial functions have been added. This improvement will also allows easy data exchange between gvSIG Mobile and gvSIG Desktop, since the mobile application of the gvSIG Suite works with SpatiaLite. More information. The OpenStreetMap cartography is one of the most widely used cartographic base worldwide. In gvSIG Desktop 2.4 we have added new OSM map services that provide both new ways of representing cartography and thematic services. The new map services available are: Open Sea Map, Open Railway Map, Carto Dark, Carto Light and HOT (Humanitarian OSM Team). More information. One of the H2GIS functions allows the direct OpenStreetMap data download. We would be able to run that sentence from the H2GIS console, but because of its usefulness (and to make it easier for users) we have decided to add it as an independent tool. It allows to download the OSM cartography of the frame that we have in our View at that moment. More information. The NASA World Wind Library, the 3D engine used by gvSIG Desktop, has been updated. This new World Wind version includes improvements in safety protocols. Through this geoprocess we can convert a table with addresses to point layers. The table, apart from addresses, could contain characteristic elements such as museums, monuments, sports facilities …, that is, any place that we can search in Google Maps, OpenStreetMap …, since they are the search engines used for geocoding.. More information. This geoprocess allows us to disperse the points that are overlapped around a central point in a layer. From a point layer, a match distance and a scatter radius, this algorithm acts on the input layer looking for groups of points whose distance is less than or equal to the match distance. It scatters them, according to the scatter radius, around the centre of that group, creating a new point layer with the results. More information. Geoprocess that implements Rossmo’s mathematical model for serial killers detection. It allows to calculate the probability that each point of a map is the usual place of a serial killer. More information. This geoprocess was developed to calculate how many people there are really in a demonstration. It allows to calculate population in a specific area. More information. This set of tools will allow us to create new icon themes so that we can customize the appearance of our gvSIG Desktop. If you are tired of the current icon set … with this add-on you will be able to change it and design your own icons. More information. Icon set to change the appearance of gvSIG Desktop completely, available in 16×16 and 22×22 size. More information. When opening a project in a concrete location, this new functionality allows you to see an image of the available projects of gvSIG Desktop, which many times can help us to identify the one we want to open. This image is updated every time we save changes in a project. More information. To facilitate the daily work of users in gvSIG Desktop 2.4, the usability of the application has been improved by placing the toolbars in the following logical order: Project actions, adding layers, zooms, attribute table, information tools, selection tools, editing tools… More information. When opening gvSIG Desktop 2.4 a new maximized view is created automatically, the first action that a user always does. In addition, the option has been added in the ‘Preferences’ of the application, so that the user can define whether or not he wants this behaviour in gvSIG or not. When adding a new layer we will see a new button ‘CRS View’ in the window, which allows to apply the reference system of the layer to the View automatically. Two new tools have been added in the “Help” menu that will surely be very useful. Sometimes the simplest things can be the most useful. One of them allows to access to all the contents of the gvSIG Desktop user manual and the other one allows to search for the appropriate documentation for a specific query. More information. A symbol library with the standard to represent the different safety pictograms can be useful for certain jobs. From now they are available in gvSIG Desktop. More information. This is a set of symbols very popular and recognizable by most users, and that they are now available in gvSIG Desktop to be able to represent your data in new ways. It contains activities, nature, flags, food and drink or objects symbols, the well-known smiley, frequently used symbols (numbers, letters, …), and places / trips (which includes means of transport symbols). More information. Through this symbol library all the official symbols related to urban and territorial planning in the Valencian Community (Spain) are available. And, of course, they can be used by all those who need this symbology. gvPy is a library that facilitates the running of geoprocesses from scripting. Among other things it allows us to run scripts from the toolbox. For gvSIG Desktop 2.4, new improvements have been added too, that allow get objects from scripting, such as charts, that were not possible to get previously. More information. Portable versions have preferences within it by default. For certain organizations that use the portable, the option to use the user’s home for preferences has been enabled; in this case if any of the preferences (scripts, symbols, …) are not in the user’s home, gvSIG will copy them there before starting. In this way the option to keep the user preferences when updating portable version distributions is enabled. The opening of projects with layers containing errors has been improved. With gvSIG Desktop 2.4, if there is a corrupt entity, the project is opened completely, indicating the layer with errors to the user, and allowing to load that layer again. The gvSIG boot has been optimized, minimizing the opening time. Loading of the EPSG database is also carried out in the background, which implies that its query is immediate. The distribution for Windows 10 to 64bits has been optimized, which presented some problems in the installation in previous versions. A new web browser has been incorporated. It optimizes the visualization of web pages where it is necessary to load them, such as in hyperlinks to web pages or in Google Street View tool. Improvements that allow quick loading of scripts have been incorporated. These improvements are especially useful since gvSIG Desktop is increasing the number of tools developed from scripting considerably. Secondary plugins have been removed from the distributions, decreasing their size at this way. In this way, the user who wants to increase the functionality of his gvSIG Desktop can do so from the ‘Add-ons Manager’ through the URL option. And there is still more, but we don’t want to launch all the novelties at once! In gvSIG Desktop 2.4, from the next week there will be three new plugins available, that will increase the functionalities of gvSIG Desktop greatly: Horton Machine, gvSIG Mobile and Epanet. Horton Machine, known as Jgrass previously, brings us a new toolbox with hundreds of geoprocesses of all kinds that are added to the more than 350 existing ones in gvSIG Desktop. With Horton Machine you will have access to tools for geomorphological analysis, for HECRAS, for LiDAR, etc. More information. gvSIG Mobile is an app for data gathering in the field available in the available in the Google Play Store. Through this new plugin we can generate the base cartography for gvSIG Mobile from a gvSIG Desktop View. In addition, we will be able to upload a project made in gvSIG Mobile directly to gvSIG Desktop, including that created with a custom form, images, etc. This is a plugin to connect with the software called “Epanet”, that allows the analysis of drinking water distribution systems. The program is public and it’s developed by the United States Environmental Protection Agency (EPA). More information here and here. We can only thank the work and support to all the people and organizations that have made this new version possible. All this work wouldn’t see the light without people who collaborate in testing, development, spreading… , and the organizations that bet on the gvSIG Association as a support organization for their ‘geo’ needs. Thank you. As a final note we would like to comment that in recent months the gvSIG Desktop team hasn’t been working only on gvSIG Desktop 2.4. In parallel they have been working on the next gvSIG Desktop version intensely and it will be called 3.0 probably because of all the changes that it includes!!! … but we’ll talk about it later. This entry was posted in development, english, gvSIG Desktop, testing and tagged gvSIG 2.4, new features, novelties. Bookmark the permalink. hi, do i need to uninstall older vision bore installing the latest one ??? and ho to uninstall it ? Hello, you can have both versions during some time if you want, there’s no problem. Then, if you want to uninstall the older version, if you have the installable version there’s an “Uninstall.jar” file in the gvSIG installation folder, you can run it. If you have the portable one you only have to delete the folder. Packages are installed that are not compatible with your system. Some are not specific to your system or architecture. You probably need to configure a x86 Java environment for the proper functioning of gvSIG. The problem is that the plugin that has been installed is for 32 bits in a 64 bits platform. Have you installed it by URL from the “Add-ons manager”, or it has been installed automatically when installing gvSIG? it has been installed automatically when installing gvSIG? 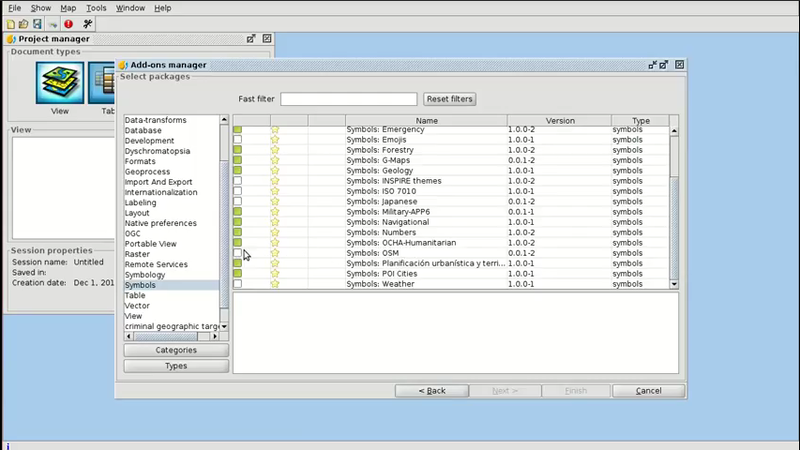 Then open gvSIG, open the add-ons manager (in the Tools menu), connecting by URL, and selecting 3D on the left. You will see the “3D View” plugin. You must install the plugin with the Windows icon that has a green dot (if you put the mouse on it you will see that it is “Windows 64 bits.” Once installed, restart gvSIG and it should work correctly and without warning. can this program work in Portugal? And you can change the language of the application to Portuguese in your case.